Artifex hydrochroma penicillo rotundo facit. 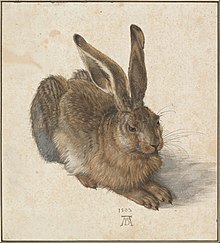 Albrechtus Dürer, Lepus Iuvenis (1502), hydrochroma et color corporea. Albertina Vindobonae. Winslow Homer, Navis Caerulea (1892). Stanisław Masłowski, Pejzaż jesienny z Rybiniszek (Scaena autumnalis apud Rybiniszki). Hydrochroma, 1902. Egon Schiele, Virgines (Theodisce Mädchen), 1911. Hydrochroma, vel pictura hydrochromatica, etiam (a vocabulo Francico) aquarella, est ratio pingendi in qua pigmenta ex pigmentis aqua dilutis fiunt. Vocabulum ambo medium et opus artis consequens attingit. Usitatum et communissimum picturarum hydrochromatibus factarum fulcrum est charta; inter alia fulcra sunt papyrus, chartae corticis, plasticum, membrana vel corium, textile, lignum, et carbasus. Hydrochromata usitate sunt pellucida, et lucida videntur quia pigmenta forma pura deponuntur, paucis immunditiis colores pigmenti obscurantibus. Hydrochroma etiam haud translucidum fieri potest per album Sinense addendum. In Asia Orientali, pictura hydrochromatica atramentis effecta pictura penicillorum vel pictura voluminum appellatur. Quae in cultura Sinensi, Coreana, et Iaponiensi fuit medium praevalens, saepe monochromatice coloribus nigris vel brunneis confectum. India, Aethiopia, et aliae civitates diutinas habent traditiones. Pictura digitalis pigmentis aqua dilutis in Sina orta est. Clarke, Michael. 1981. The Tempting Prospect: A Social History of English Watercolours. British Museum Publications. ASIN B000UCV0XO. Finch, Christopher. 1988. Twentieth-Century Watercolors. Abbeville Press. ISBN 0-89659-811-X. Finch, Christopher. 1991a. American Watercolors. Abbeville Press. ASIN B000IBDWGK. Finch, Christopher. 1991b. Nineteenth-Century Watercolors. Abbeville Press. ISBN 1-55859-019-6. Hardie, Martin. 1966–1968. Water-Colour Painting in Britain. 3 vol: 1, The Eighteenth Century; 2, The Romantic Period; 3, The Victorian Period. Batsford. ISBN 1-131-84131-X. Lyles, Anne, et Robin Hamlyn. 1997. British watercolours from the Oppé Collection. Tate Gallery Publishing. ISBN 1-85437-240-8. Moore, Sean. 1994. Ultimate Visual Dictionary. Dorling Kindersley. ISBN 0-7513-1050-6. Shanes, Eric. 2001. Turner: The Great Watercolours. Royal Academy of Arts. ISBN 0-8109-6634-4. Wilton, Andrew, et Anne Lyles. 1993. The Great Age of British Watercolours (1750–1880). Prestel. ISBN 3-7913-1254-5. Sideway, Ian. 2000. The Watercolor Artist's Paper Directory. North Light. ISBN 1-58180-034-7. Turner, Jacques. 1992. Brushes: A Handbook for Artists and Artisans. Design Press. ISBN 0-8306-3975-6. Turner, Sylvie. 1998. The Book of Fine Paper. Londinii: Thames & Hudson. ISBN 0-500-01871-5. Wilcox, Michael. 2000. The Wilcox Guide To The Best Watercolor Paints. School of Colour Publications. ISBN 978-0-9679628-0-1. Brandt, Rex. 1972. The Winning Ways of Watercolor: Basic Techniques and Methods of Transparent Watercolor in Twenty Lessons. Van Nostrand Reinhold. ISBN 0-442-21404-9. Dewey, David. 1995. 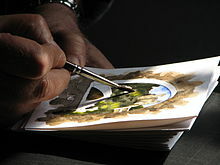 The Watercolor Book: Materials and Techniques for Today's Artist. Watson-Guptill. ISBN 0-8230-5641-4. Janis, Donna Seldin. 1997. Sargent Abroad: Figures and Landscapes. Abbeville Press. ISBN 978-0-7892-0384-7. LeClair, Charles. 1999. The Art of Watercolor. Ed. retractata et amplificata. Watson-Guptill. ISBN 0-8230-0292-6. Royal Watercolour Society. 2004. The Watercolour Expert. Cassell Illustrated. ISBN 1-84403-149-7. Ruskin, John. 1857, 1991. The Elements of Drawing. Watson-Guptill. ISBN 0-8230-1602-1. Seymour, Pip. 1997. Watercolour Painting: A Handbook for Artists. Lee Press. ISBN 0-9524727-4-0. Smith, Stan. 1995. Watercolor: The Complete Course. Reader's Digest. ISBN 0-89577-653-7. Tappenden, Curtis. 2003. Foundation Course: Watercolour. Cassell Illustrated. ISBN 1-84403-082-2. *Whitney, Edgar A. 1974. Complete Guide to Watercolor Painting. Dover Edition. Watson-Guptill. ISBN 0-486-41742-5. Vicimedia Communia plura habent quae ad hydrochroma spectant.